Offering your customers the ability to make payments anywhere, at any time. Contact us to discuss how self-service kiosks can benefit your company's bottom line. Fill out the form to find the best self-service payment terminal for your business. We can design the ideal payment kiosk for your company, incorporating the exact hardware specification that you need. Handling walk-in bill payments is a vital customer service function for utility service providers. However, traditional cashiering methods are time consuming and take away resources from customer services and revenue generating activities. Rapidly increasing personnel and back office costs are an ever-growing concern, and since a quarter of households worldwide do not have sufficient access to bank accounts, many customers can be forced to wait in long queues simply to pay their everyday bills. These challenges have led many executives working for utility companies and government service providers to look for ways to serve their customers more efficiently, without hampering staff and increasing operational costs. Kiosk Innova’s bill payment kiosks are the solution. More and more businesses are attracted by the significant advantages offered by bill payment kiosks. Self-service kiosks allow all sectors to reduce their staffing costs, leading directly to savings in total overheads. Employees are thus free to concentrate fully on other customer needs, enabling them to improve service. Thanks to bill payment kiosks, telecom, energy, finance and retail companies gain access to secure units in which to collect cash and cheques. Members of the public can pay their bills easily by using their customer card or simply entering their bill number. 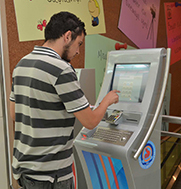 The use of self-service bill payment kiosks also helps companies to reinforce their image as high-tech operators. 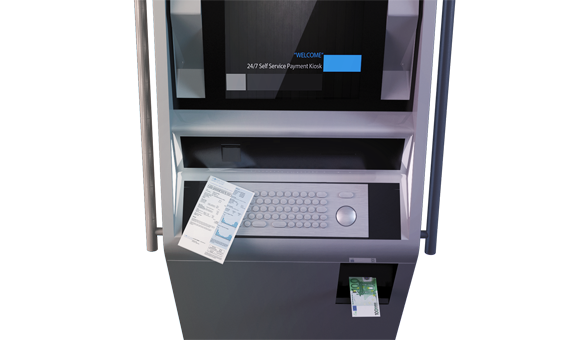 Kiosk Innova bill payment kiosks allow companies to offer any type of payment method their customers require. For example, full, partial and advance payment options can be offered to postpaid customers, while a variety of other payment options can be presented to prepaid customers, including top-up and voucher sales. Debit or credit card payments, cheque or cash payments (payment processes) can all be offered through Kiosk Innova bill payment kiosks. You can simply choose the specification your company needs and place an order today, to start collecting payments. 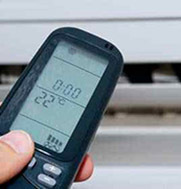 Emicool, one of Dubai’s leading air conditioning companies, chose Kiosk Innova to supply its new bill payment kiosks. Denizli Metropolitan Municipality has chosen Kiosk Innova kiosks to provide citizens fast and convenient self-service payment channel for utility and tax payments. READY TO TAKE A STEP FORWARD?